Scooters rule here in Vietnam. Everywhere and always–they serve as the family mini-van and commuter car. I have seen families of five on one small scooter. Helmets required here which is cool to see after the helmet-optional China scene. I see more air masks on most riders too than in China, though the air pollution is far less. Ladies ride side saddle, dressed to the nines with their sparkly high heels and crossed legs perfectly comfortable and toddlers hold on for dear life between their parents legs, standing up on the floorboard by the handles. This is life in Vietnam. 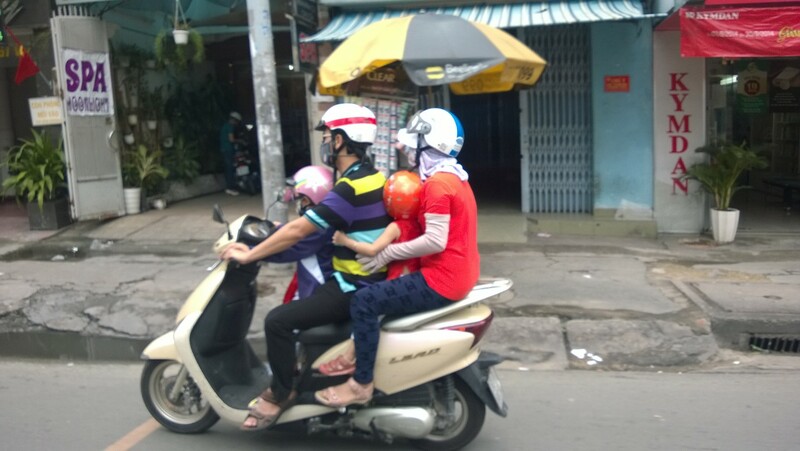 Vietnam’s version of the mini van–scooter for 4! 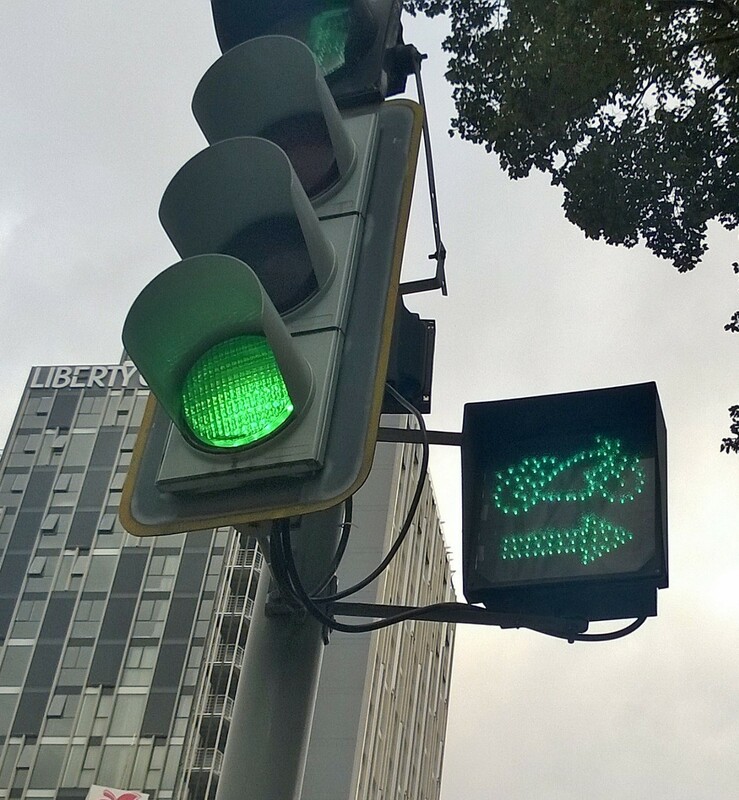 At least scooters have their own traffic signals and designated lanes on most streets. You don’t see the luxury cars here that you would in China. It’s mostly taxi’s and scooters. Not even really bikes-just a few “seasoned” folks riding old school. When it poured in a torrential thunderstorm yesterday with high winds, the scooters went into hiding until the weather calmed and then they flooded the streets to resume their commute. They sell special scooter rider poncho’s everywhere–hood, extended arms and headlight coverage as well. Still, those poor riders had to be soaked to the bone yesterday with the waves of water coming down so heavy. Today the weather dawned clear so as Thom and I checked out the boardwalk by the Saigon River, I shot this video–at 7:30 a.m. on a Sunday when we thought the streets would be deserted, making the crossing across the wide boulevard by the river much easier. We went by there yesterday and didn’t even attempt it. NOPE! The scooters were out in full force early so we had to be super nimble and scoot our asses across the street dodging the masses. That’ll wake you up! I don’t advise most people to try this–last night we saw our doormen escorting some tourists across a small street by the hotel to keep them alive. Not for the fainthearted!